Explore the ancient art of needle felting with a dash of contemporary abstraction based on the art of Joan Miro and Friedensreich Hundertwasser. 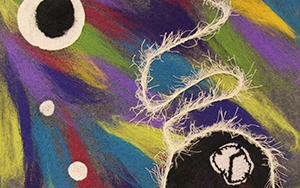 Students will create pieces using needle felting with wool and other fibers. Modern hand stitching elements will add another layer of interest and story to the work, which takes its inspiration from a blend of architecture and surrealism that these two artists were known for. $25 materials fee payable to instructor on the first day of class.